Kim Lozano teaches creative writing for the St. Louis Writers Workshop and St. Louis Oasis, a lifelong learning organization for people over 50. Her essays, poetry, and short fiction have been published or are forthcoming in Poetry Daily, The Iowa Review, Alaska Quarterly Review, American Life in Poetry, Denver Quarterly, North American Review, and elsewhere. In the clamshell of my fist. The insect strains against my hold. Yellow—and affix the sticky jewel to my arm. Both of us fading and fading. 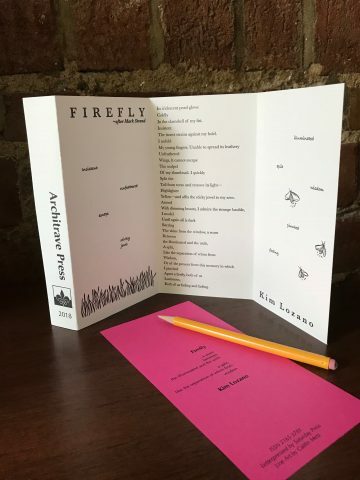 Poem letterpress printed by hand on 100lb archival card stock measuring 12.5″ x 7.5″ with 3 folds & packaged in an individual sleeve. Numbered edition of 50 copies.